Discussion in 'Magazines' started by shely, Feb 21, 2009. For some bazaar reason. It reminds of me Vogue Paris March 2009. It must be the make-up..
Who is wearing Prada on the cover? cute movie still edit. wonder if there's a movie that inspired it. daul looks amazing thanks shely! I'm getting a modern take of In The Mood For Love. 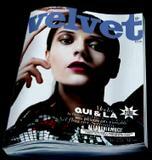 you have veery good mags and velvet is rising everyday as the new vogue. very nice hoping to see more editorials of this mag.